If you’ve been reading my blog, you probably know how I feel about Christmas and the holiday season. And if you’re a new reader, welcome! I’m glad you’re here. Either way, the fact of the matter is this: I LOVE THIS TIME OF THE YEAR. And whether you wish people “Merry Christmas,” “Happy Holidays,” “Seasons Greetings” or “Happy Hanukkah,” I wish the same sentiment back to you. My view last Christmas. There is really no place like home for the holidays. A big part of the holiday season is giving presents and you guys, I have to tell you, I love finding the perfect gift for the people on my list. I’ll literally spend hours (it’s okay, as I love to shop) searching for the one thing that my mom actually wants (she’s really hard to shop for) or scooping up the perfect gift for my nephews and little sister. The other thing I love: shopping local. My family owns a general store (bought by my great-grandpa and grandpa many years ago) and I so appreciate the people who choose to shop locally as it makes such an impact not only in my family’s business, but in the community. 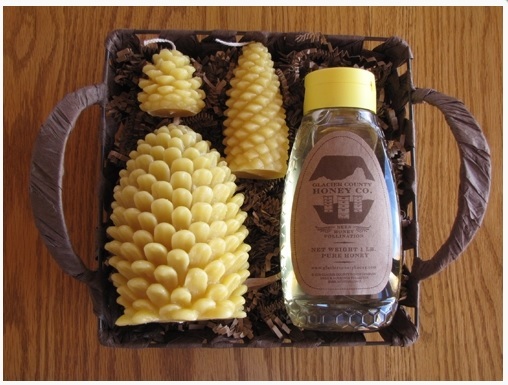 Anytime I can purchase a made in Montana item for the people on my list, it makes the gift that much more special. And since shopping is one of my strengths, I’ve compiled a top 10 list of made in Montana holiday gift ideas. 1. T Bird Leather. There are a few reasons to love T Bird Leather. 1) Tress, the genius artist behind T Bird Leather is nice and adorable. 2) Her totes, wallets and clutches are beautiful. 3) My nickname is T-Bird. I also have to tell you that I have one of the totes from T Bird Leather and I’m obsessed with it. It has traveled all over Montana with me and gets prettier with age. Currently, you can pick up her items at The Toggery (with locations in Whitefish and Kalispell) and upcoming events. 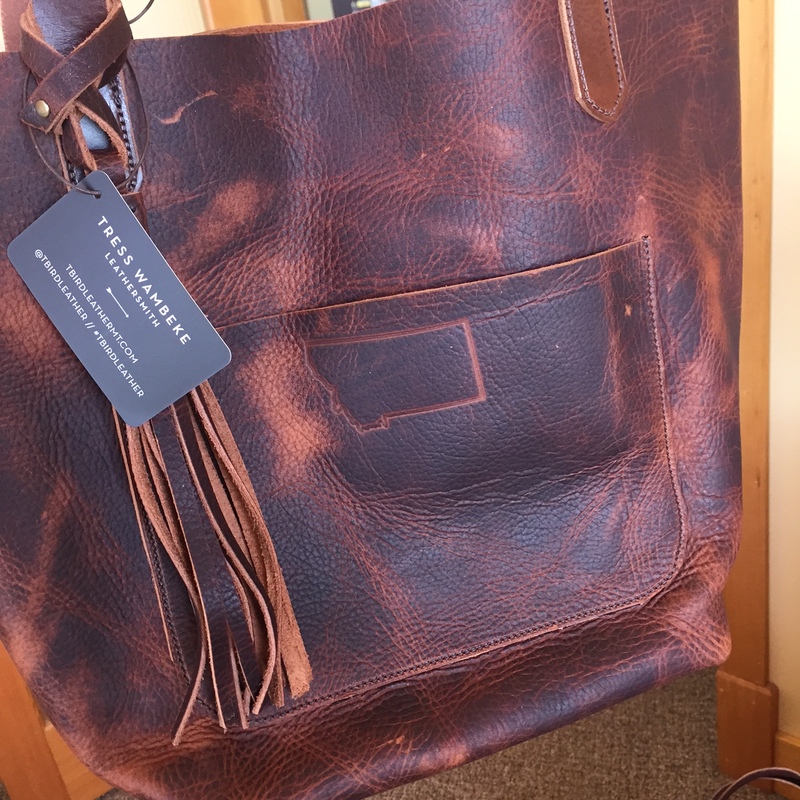 A T Bird Leather Tote (with a custom Glacier Country Montana brand). This branded tote is available here. 2. Huckleberry anything. If there’s one thing I know, it’s that people can’t get enough of huckleberry-flavored items. (Check out these blogs from Quirky Travel Guy and Camels + Chocolate for more proof). While there are a few places to pick up huckleberry goodness in Montana (hello Polebridge Mercantile and your homemade huckleberry macaroons), The Huckleberry Patch in Hungry Horse has a wide variety of items. Plus, you can order items online. 3. Sapphires, Montana’s most precious gemstone. Sapphires, a precious blue gemstone, can be mined in Montana, specifically in the cute town of Philipsburg. 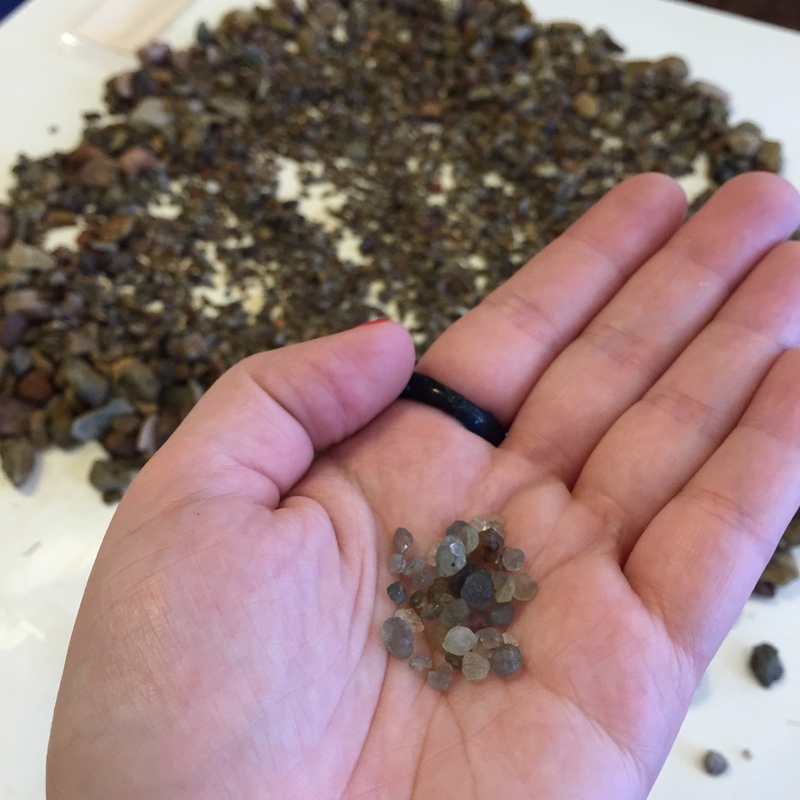 Both Gem Mountain and The Sapphire Gallery offer their customers a chance to wash gravel and find their own precious gemstones. Gem Mountain also ships gravel so the sapphire lovers in your life can mine anytime…like Christmas morning! You can also shop for made in Montana sapphire jewelry from The Sapphire Gallery here. 4. Glacier County Honey for your honey. Billing itself as “the best raw honey you’ve never tasted” and made by bees in the shadow of Glacier National Park, Glacier County Honey has a variety of bee-created products. While you can purchase raw honey, Courtney (Mrs. Beekeeper) also has a variety of gift baskets comprised of jars of honey, beeswax ornaments and local Montana tea. Glacier County Honey is found in a variety of stores in Montana (including in Browning, Columbia Falls, Whitefish, Augusta and Kalispell) and online. 5. Hand-painted artwork. Home to the work of Montana artist Randy McIntyre, Elk Camp Arts has a variety of hand-painted items that make great holiday gifts. Randy has a variety of items in his shop, including canvas paintings, greeting cards and hand-painted beer mugs and wine glasses. 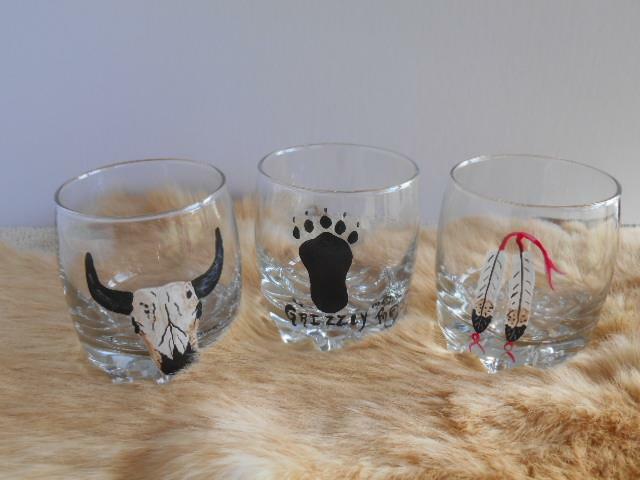 Western painted shot glasses. Photo courtesy of Randy McIntyre. 6. Homemade preserves. 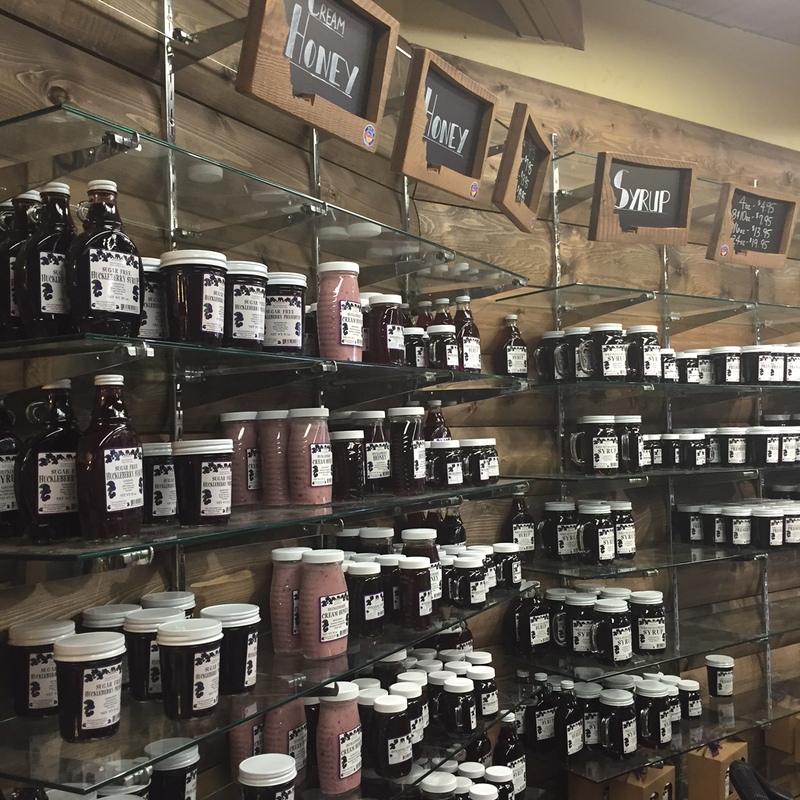 A Montana staple for more than 60 years, Eva Gates Homemade Preserves has a shop in Bigfork as well as an online store where you can order made in Montana preserves, fudge and Christmas gift boxes. 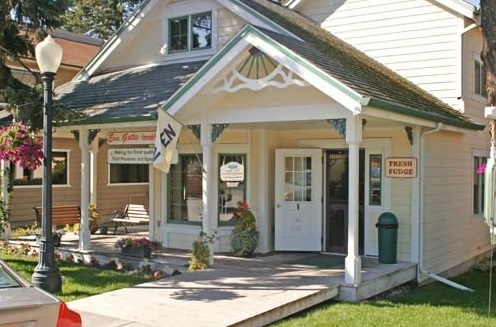 Eva Gates shop in downtown Bigfork. 7. Montana love for your love. You’ve probably noticed that I have a couple of items I wear on repeat: a Montana love T-shirt and a Montana love hot pink hat, both made by the folks at Montana Shirt Co. The two reasons I wear them: 1) I love Montana. 2) Um, they are so cute. I’ve also gifted similar items like this to my out-of-state friends and family who also love Montana and they’ve been a big hit. Needless to say, these two items are on repeat in my closet. 8. 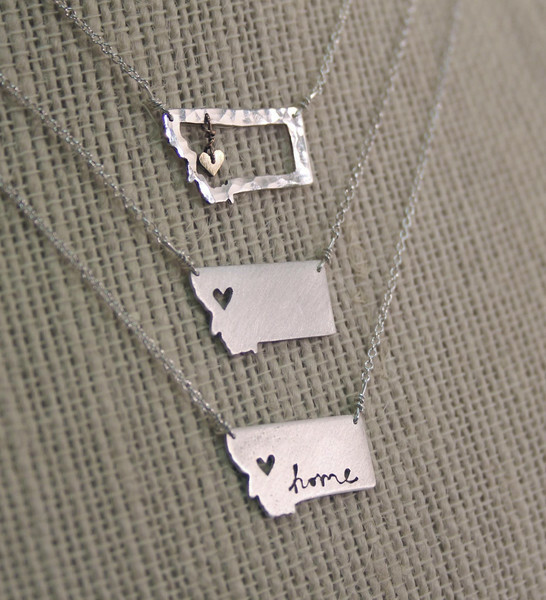 Montana-lovin’ jewelry. Truth time: I love jewelry. And I blame (or in this case, THANK) my mama for my love of jewels. There are a few shops and artists that I adore for picking up made in Montana jewelry. They are Miakoda Creations (located in the Stumptown Marketplace in Whitefish and online here), Poisonberry (located in a few local shops and here) and Ruby and Revolver. Another local favorite: the Montana Shop at The University of Montana. On the left: my bracelet from Miakoda. 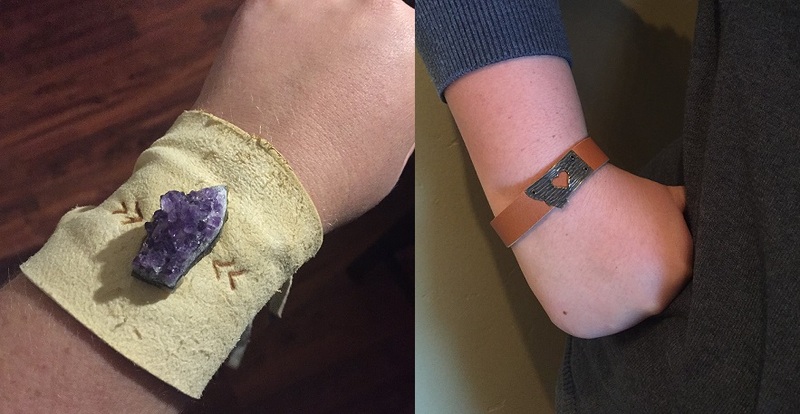 On the right: my friend’s bracelet from Poisonberry. Silver necklaces from The Montana Shop at UM. Photo courtesy of The Montana Shop. 9. Belt buckles. It doesn’t really matter where you live or what you do for a living, chances are at some time or another, you’re going to need to wear a belt. And in my mind, if you’re going to wear a belt, you ought to have an awesome belt buckle to go with it. My favorite belt buckles to date are from Wild Horse Steelworks. Because who doesn’t love a belt buckle in the shape of Montana? 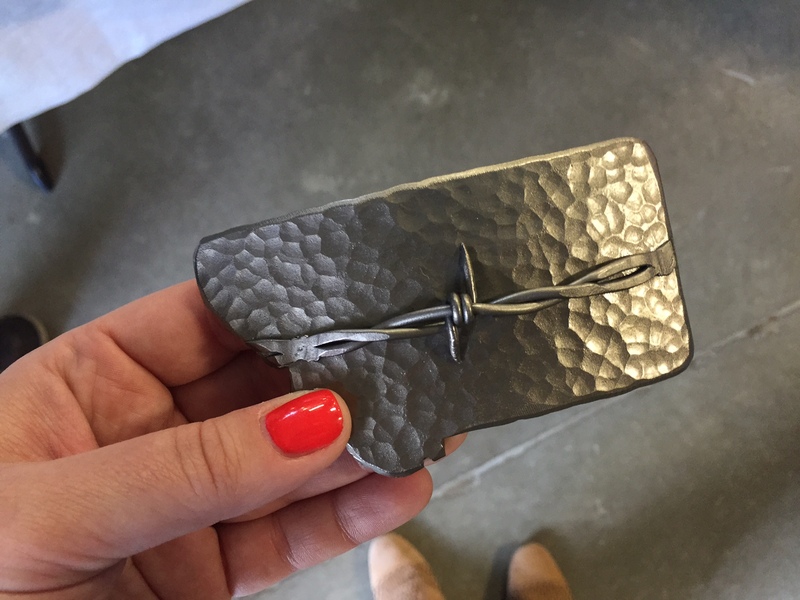 A made in Montana buckle, complete with Montana barbwire. 10. Beautiful pottery. I’m not going to lie to you, when I was younger I thought there was no way in the world I’d ever own a piece of pottery. Well the joke is on me because the older I get, the more I appreciate and love having beautiful dishes. One of the best places to get a variety of pieces is Whitefish Pottery. Located in downtown Whitefish, they have a variety of mugs, baking dishes and serving bowls. You can pick up pieces at the store or peruse their offerings online here. A look at some of the items from Whitefish Pottery. Photos courtesy Tom, Whitefish Pottery. You can also check out items on our shopping cart at www.glaciermt.com/shop. And in the meantime, Happy Christmas, Merry Holidays, Seasons Greetings and Joy to the World. 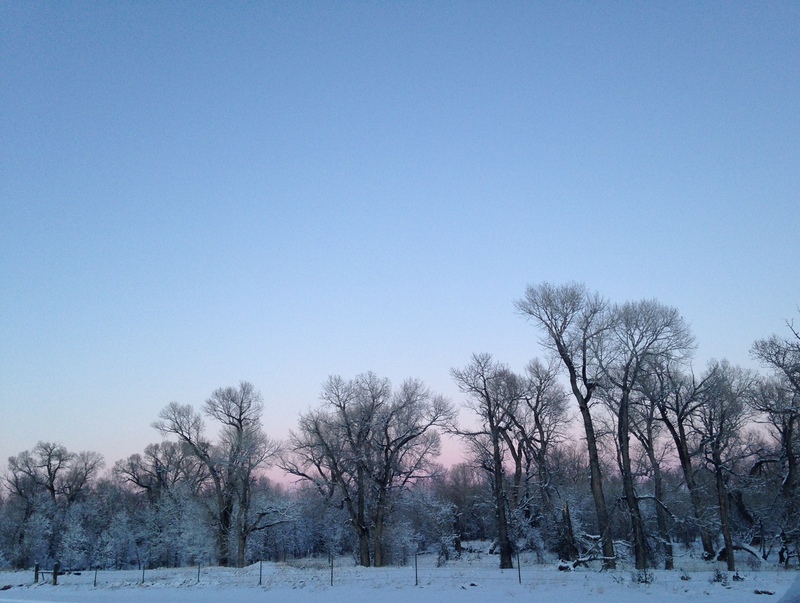 This entry was posted in Uncategorized and tagged Christmas, Holidays, Made in Montana, Shop Local on December 1, 2015 by tiatroy. Thanks for the sweet post, Tia! Love the list Tia! You made it easy for all of us :-). Tia, what a great list! And so glad they are offered online for those of us who can’t get to the amazing stores mentioned. Merry Christmas to you, your fab colleagues at GC, and to your family. If weather permits, I may make it to your mama’s store and another favorite store in Augusta, Latigo and Lace, over the holidays. Good job putting this together! I’m also trying to put together a post of places people can buy local gifts from, so this helped. Thanks so much for including me in the Top 10 Tia…It is a real honor. Any chance you know of a vendor who makes Montana-shaped cutting boards? The 406 Bar and Grill in Kalispell used them to serve bread (when we visited this summer), but they weren’t selling them. I thought they would make a great gift! That would be a great gift! I’m not sure…but will work on finding that info out. Thanks Gretchen!